Simply Stunning! Finished to show home condition with sleek modern interior including a host of extras above and beyond the standard turnkey finish, Number 38 Loguestown Green boasts three bedroom (master ensuite), one and a half reception accommodation. This beautiful home has been finished to exacting standards by the current owners and offers style and elegance from the moment you enter the front door. 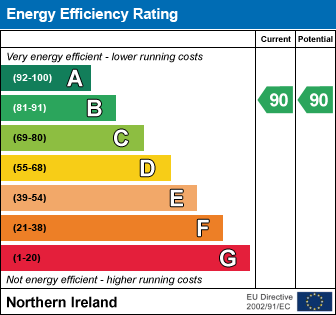 Excellent energy efficiency comes from Gas Fired Central Heating, uPVC double glazed windows and doors and solar panels. Only on internal inspection can one fully appreciate the full extent of this beautiful home, we expect keen interest and therefore fully encourage early internal inspection. with solid wooden flooring, under stairs storage, telephone point, mains powered smoke alarm. with low flush WC, wash hand basin in vanity unit, floor to ceiling tiled splash back, tiled floor, extractor fan. with wood burning stove, solid wooden flooring, recessed lighting, TV point, mains powered smoke alarm. with eye and low level ivory units, tiling between, gas hob, electric under oven, integrated fridge freezer, stainless steel hood and extractor, under unit lighting, bowl and a half sink unit, integrated dishwasher, polished ceramic floor tiling, recessed lighting, mains powered smoke alarm. with eye and low level ivory units, contemporary worktops and up stands, single bowl sink unit, plumbed for washing machine, space for tumble dryer, polished ceramic floor tiling, extractor fan. with linen store, access to attic, mains powered smoke alarm. Ensuite: comprising; low flush WC, pedestal wash hand basin, fully tiled corner shower cubicle with mosaic border, thermostatic shower fitting, fully tiled on one wall, tiled floor, recessed lighting, extractor fan. comprising; free standing roll neck bath, fully tiled corner shower cubicle with thermostatic shower fitting, low flush WC, pedestal wash hand basin, fully tiled around sink and shower, tiled floor, recessed lighting, extractor fan, heated chrome towel rail. Property approached by tarmac driveway with additional parking area. Front garden in lawn, rear garden in lawn, enclosed by post board fencing. Outside lights and tap. From the Bushmills Road turn right and proceed to the bottom of the road turning right in Loguestown Green. Follow the road, Number 38 will be on your left. I am interested in 38 Loguestown Green, Coleraine. Please contact me about this property.